For the last year or three there’s been an Internet meme called “Buy A Gun Day” urging people to buy a gun on April 15. The date is appropriate because it’s when our taxes are due. It’s even more satisfying to use one’s tax refund to buy a gun—sort of sticking it to the man (you can tell I was around in 1969). I believe “Buy a Gun Day” (BAG Day) started on Aaron’s Rantblog (now defunct) and moved to other sites. BAG Day is not organized in that no central authority collects data on how many people buy a gun on April 15. A number of bloggers are supporting it this year (see below for links). Countertop Chronicles pointed me to the poster I put on my sidebar (I thank him for it; I don’t know why, but I love that poster). As I said, no one gathers statistics on how successful the day is. There’s no one giving brownie points for buying a gun and it’s not even necessary to wait until April 15 to buy one (I know I didn’t wait—but don’t tell Bill). Whoops, I let the cat out of the bag. I already used my tax refund to buy two guns; a Russian Nagant M1895 revolver I blogged about here, and Wednesday evening I bought a Winchester M1894 in .45LC that Bill and I may use for Cowboy Action Shooting; if we ever get over our mild aversion to dressing in cowboy costume. This is not to say, however, that I won’t celebrate BAG Day again on or about April 15. My passion for firearms is one obvious reason I support BAG Day. For me, collecting and shooting are the only valid reasons I truly need, that and a handful of cash. But, I have another reason too. I believe convincing non-gun owners to become gun owners is the best way we can ensure our Second Amendment rights for our children and grandchildren. A recent Gallup poll showed that 33% of women and 49% of men own guns. About 40% of the nation own guns and this is down from a more or less historic norm of 47%. Gun control laws passed in the 1990s may have been a factor in the drop. As this number drops, our rights become more and more imperiled. One heartening fact is that female ownership appears to be up. While poll results vary, a May 2000 poll found a female ownership rate of 22%. (Note: Polls are not available unless you register for a free trial or have a subscription.) I honestly believe that the events of 9/11/2001 played a large role in convincing women to buy guns. I can’t prove it, but I think women finally understood evil lies not in a tool but in a person’s heart. Range days (taking newbies to a range) is a great first step so long as newbies go on to buy a gun. 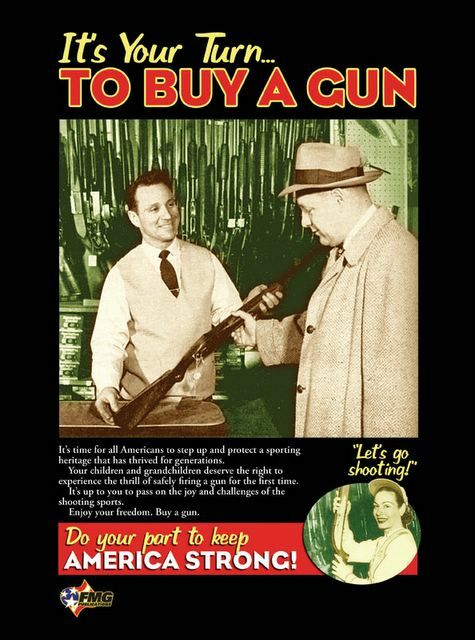 Once a person puts his or her money on a gun store counter, he or she becomes a gun owner. They begin to understand how a legal, innocent activity such as owning and shooting guns can be fraught with so much political fervor. They become a member of an often demonized class of people; we Neanderthalic, slope-browed, knuckle-walking gunowners. And she knows she has not changed. There are a lot of casual gunowners and Fuddites who’ll never involve themselves in Second Amendment politics. They may even argue citizens shouldn’t own handguns or black rifles, but even they understand when a gun grabber tries to seize their property. Granted, most of them may quietly surrender their firearms if it ever comes to that. However, they’re more likely to vote for pro-gun rights people than if they’d never owned a gun. So, that’s one reason why I support Buy a Gun Day: The more of us who are gunowners, the less likely it is for gun haters to win. Take your spouse out on April 15 and buy him or her a gun (follow all applicable laws of course). Buy your kids a gun. Convince a neighbor to buy a gun. So Happy BAG Day y’all. Machine Gun Crime in D.C.